Today`s compact 100-watt HF rigs are designed to operate from about 12-16 volts, with output signal distortion, output power problems, and transceiver reset often occurring when voltage drops below 12 volts. First - even low resistance DC wiring can result in a noticeable voltage drop. For a 100-watt transceiver with a 20-amp typical current requirement, just 1/10th of an ohm resistance in your DC cable and connectors results in a 2-volt drop! And second - when you turn your car off, battery voltage drops from around 13.8 volts to close to 12V after a short period of time. Couple this with any voltage drop in the cables, you suddenly have a problem. 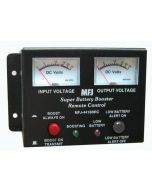 MFJ’s Super Battery Booster eliminates low voltage problems by boosting input voltages as low as 9 volts up to desired 13.8 volts at up to 30 amps peak with a typical efficiency of close to 90%. MFJ-4416C includes Anderson PowerPoleTM connectors and high-current 5-way binding posts for both the DC input and regulated output. An internal 30-amp input fuse protects the unit from excess output current demands. There are also selectable limits on the minimum voltage that the unit will accept: 9-volts, 10-volts (default), and 11-volts. This protects you from over-discharging a battery and possibly damaging it. Also includes output over-voltage crow-bar protection should regulation be lost. Two additional features offer ways to increase efficiency even more! The external boost enable Input allows remote enabling of the MFJ-4416C. You can either ground a line or connect the line to 4-13 Volts. You can also use an amp key line or ignition source to enable. The second efficiency enhancement feature is a user-adjustable output voltage control which lets you set the output voltage anywhere between 12- and 13.8-volts. When setting the output at 12-volts, input voltages greater than 12V will pass through, but the efficiency of the regulator is higher. And lower input voltage means your transceiver will run cooler! Typically save over 30 watts in heat dissipation during transmit, and even 3-4 watts during receive. So it can actually be good to let the voltage sag to 12V, then let MFJ-4416C protect from lower voltages. Just 73/4Wx4Hx21/8D” and lightweight at 1.3 lbs.